Joseph L. Nambo, Lieutenant (jg), born Feb. 20, 1920, Concordia, KS. Graduated high school and from Naval Air Training Center, Corpus Christi, TX. Joined the USN May 18, 1938, and was stationed at San Diego NTS; USS West Virginia; Ford Island VS38; VB127 Port Lyautey; Naples, Italy; Ajaccio, Corsica and Lake City, FL. 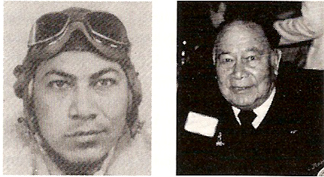 Memorable experience was graduating as naval aviator at Corpus Christi, TX; being one of the first Mexican naval aviators in the USN; invasion of Southern France, San Tropez. LTJG Nambo was discharged Dec. 5, 1945. His awards and medals include the Good Conduct, Sharpshooter and all the usual. Employed with Federal Aviation Agency Air Traffic Control Team, Kansas City Intl. Airport and retired in July 1974 as supervisor. Married 46 years to Betty L. Smith of Appleton, MO. They have two sons, one daughter, four grandchildren and two great-grandchildren. He likes all sports and is chief timer and knockdown judge National Golden Gloves. Read Joseph Nambo's story "Plane Crazy" here.